What is nursing? What do nurses do? How do you define it?The 3rd Edition of this AJN Book-of-the-Year Award-Winner helps you answer those questions with a unique approach to the scientific basis of nursing knowledge. 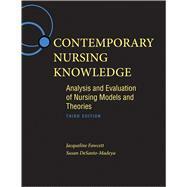 Using conceptual models, grand theories, and middle-range theories as guidelines you will learn about the current state and future of nurse educators, nurse researchers, nurse administrators, and practicing nurses.A bonus CD-ROM in every book features conceptual model- and theory-based practice applications, practice tools, research applications, and research instruments, as well as a complete bibliography and lists of additional resources to help you study.